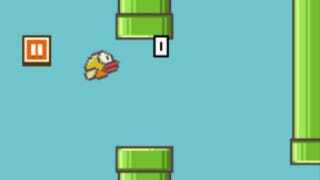 Flappy Bird is a game in which players tap the screen to make the titular Nintendo sprite conversion navigate a series of familiar pipe obstacles. It's sloppy, frustratingly difficult and covered with in-game ads. It's also the most popular free app download on iTunes. What gives? That's the question being asked by Joseph Bernstein, who explores the stupid little game's rise to fame (or infamy) in his BuzzFeed article, "Why On Earth Is This Borderline Crappy, Impossibly Hard Game The Most Popular Download On The App Store?" It's an excellent question. I hadn't even heard about Flappy Bird until I read Bernstein's take on it this morning, largely because the free app charts on iTunes are a joke. While the paid charts can be taken as an indicator of a popular, well-made app or game, the free charts are home to oddball titles like 100 PICS Quiz, Match the Dots and Candy Crush Saga. Flappy Bird has quite the following, with more than 60,000 user reviews averaging four stars. Reading through several of these reviews, I can't help but feel like someone, perhaps everyone, is taking the piss. I've downloaded the game, played it for ten minutes, and I don't feel like I need to play it any longer. Basically you tap the screen to make Flappy fly. He moves forward at a constant rate, and you are in charge of making sure he's at the right height to pass through the warp pipes, which do not warp anywhere. That about sums it up. It's my best score so far, likely the best I'll ever get. I can't play this. The graphics are charming, in a stolen sort of way. The sound is bare. The music — well, there is no music. It's just flapping forward unto certain death — Super Hexagon without all the hexagons and spinning and music. The way I see it, iPhone owners will download anything as long as it's free and looks vaguely like a Nintendo game. There is nothing magical about the game — it's simply a fluke. Still, I like Bernstein's evaluation of Flappy Bird, even if I don't quite agree with it. That may be why the game is ultimately so brilliant: It's terrible and crappy and soulless, but also wonderful and addictive and funny. It is hideous and pixelated but nostalgic and beautiful. It's incredibly hard but it also exacts no cost for losing. It is a question and an answer, a problem and a solution, and perhaps the alpha and omega of mobile gaming.